Samsung has begun rolling out its new official Android 6.0.1 Marshmallow firmware for the Galaxy Note 5 (Model-SM-N920C). The new firmware update comes with lots of new features like Tweaks for TouchWiz, performance improvements, and new features like Google Now on Tap and Doze. If you are the user of Galaxy Note 5 (Model-M-N920C) or bought the phone from the Cambodia, then you can apply this new update on your phone. If you have some other model then you have to weight some more to get this new firmware update. To apply this new update on your Note 5 phone all you need a firmware zip file, Samsung USB drivers, PC and ODIN flash tool. The process is very simple and takes a few minutes to complete the whole task. 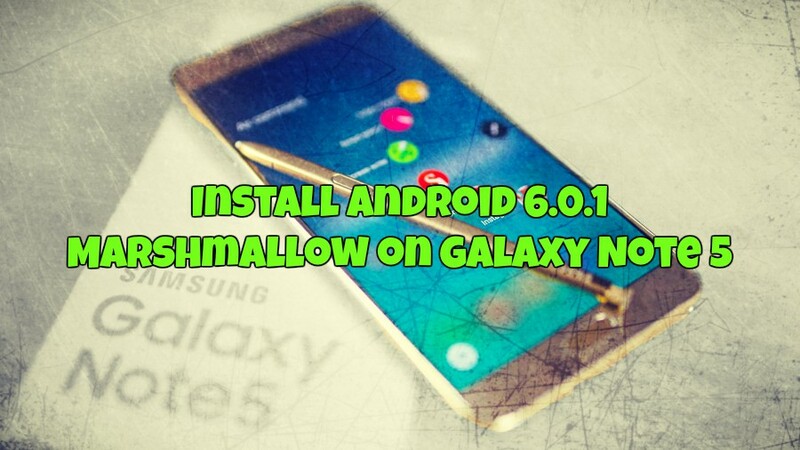 Here in this guide, we’ll show you how to that and install the Android 6.0.1 Marshmallow on Galaxy Note 5. Remember this guide is only for the Galaxy Note 5 (Model-M-N920C) users and don’t try this method on any other Note 5 models. Before following this guide do take the full backup of your phone and read all the instruction very carefully. Step 1. First you have ti install the SAMSUNG USB driver on your PC. Use this link to install the same on your PC. Step 2. Now download the Android 6.0.1 Marshmallow Update zip file here and extract the folder on your desktop. Step 3. To flash the firmware on your Note 5 you need an ODIN falsh tool. Download it form here and extract the folder on your desktop. Step 4. Now run the ODIN.exe file on your desktop and boot your note 5 in download mode. To do this turn off phone, then hold VolDown+Home+Power to boot – if it asks you to press a button to continue. Now reboot your phone and enjoy the latest Android 6.0.1 Marshmallow on Galaxy Note 5.